Chennai has been hit by record levels of rainfall over the last few days. The rains have left thousands of people stranded, shut down offices and businesses, and 188 lives have been lost. But amidst the gloom, there’s some hope. Indian startups are going out of their way to help Chennai’s stricken populance in any way they can. Here are some Indian startups that have pitched in to help with the Chennai floods. 1. Ola: When Twitter commentators made jokes about how Ola should run boats instead of cabs given the state of Chennai’s flooded roads, the company stepped up to the challenge. 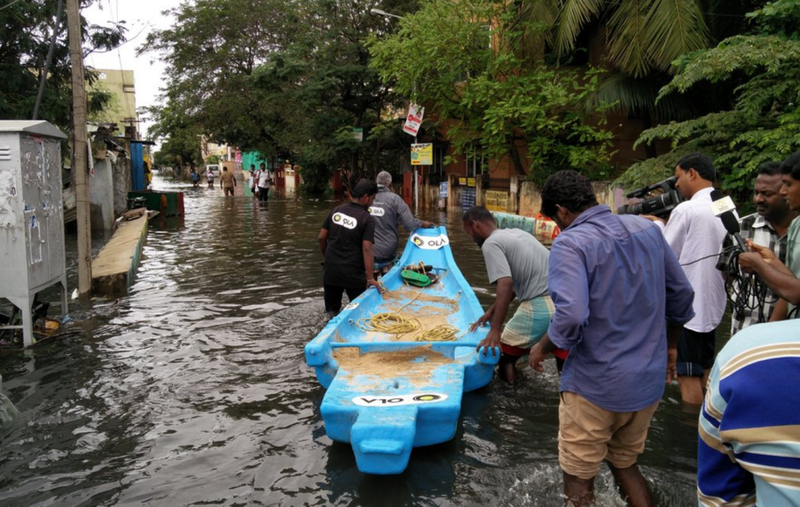 Ola deployed boats in Chennai free of cost that rescued stranded people, and helped out with relief and rescue efforts. 2. Paytm: The company has announced free recharges for Chennai numbers. Communication becomes a priority in these tough times, and Paytm is doing its part to help the people of Chennai. People can share their friends’ phone numbers on 18001030033, and Paytm will recharge those numbers for Rs. 30. 3. Zomato: Zomato has announced that it will help in getting food to flood affected areas. For every Chennai Relief meal users buy, Zomato will buy one and have it delivered to those who need it. 4. Practo: Medical services aggregator Practo has created a list of doctors that are currently available in Chennai and has shared it on its social media platforms. The list is being updated every hour. You can access it here. 5. The NewsMinute: The news site has been active through the floods, updating its twitter with lists of people who can provide accommodation to those who are stranded in Chennai. It is also going the extra mile by verifying these listings through phone calls. 6. Oyo Rooms: The budget hotel chain has offered discounted rooms in Chennai for those who had nowhere to spend the night. 7. ZoomCar: ZoomCar had to suspend its services in Chennai thanks to the rains, but is providing free pick ups and drops to those who needed to visit a hospital. Due to rains in Chennai, we are shutting operations today & are providing free pick up & drop to your nearest hospital. Call 044-42052772. We’ll keep updating this list as more companies announce initiatives. These companies are setting examples for others to follow.